Director Mary Zimmerman has spent her career drawing on classic tales from many cultures and time periods, as well as staging everything from all-American musicals to grand operas. Now, for the holiday season confection she has whipped up for her original creative home, Lookingglass Theatre, she has turned to “The Steadfast Tin Soldier,” a macabre story by that Danish master of fairy tales, Hans Christian Andersen. And to bring it to the stage she has looked to the English pantomime tradition – that long popular Christmas season family spectacle that draws on song, dance, slapstick, satire, cross-dressing and a good bit of naughtiness – wrapping it all up in the sort of visually stunning ways for which she and her design collaborators have long been renowned. The hourlong show, with a zany, not-to-be-missed silent prologue that unfolds as the audience takes its seats, has no dialogue. But drawing on all her ingenious storytelling tricks – and employing everything from puppets of radically different scale, to cleverly labeled costumes, to giant alphabet blocks, to a variety of blackly comic physical hijinks, to a bravura quartet of musicians (playing the fanciful original music composed by Andre Pluess and Amanda Dehnert) – Zimmerman and her cast bring Andersen’s story to vivid life. Victorian theater conventions are part of the mix, and so are the sort of pageant-like follies reminiscent of the early years of the now defunct Redmoon Theater. But be advised: This is not really a show for young children. Andersen’s story is decidedly dark and cruel, and rife with the sort of emotional and physical bullying that has become a particular plague of late. “Tin Soldier” does not show human beings (whether parents, babies, nannies, fishmongers or street urchins) indulging in their golden best behavior, and that, of course, makes it ideal for adults. The main backdrop for the show – a visual feast whose fabulous design team includes Todd Rosenthal (sets), Ana Kuzmanic (costumes in ravishing colors and with zany hats), TJ Gerckens (lights), Amanda Hermann (props), and the artists of the Chicago Puppet Studio – is a giant advent calendar with windows full of seasonal symbols. But that “curtain” also opens up into a family dining room complete with iron stove, and several deep perspective scenes that suggest the alleys and sewers of Europe. 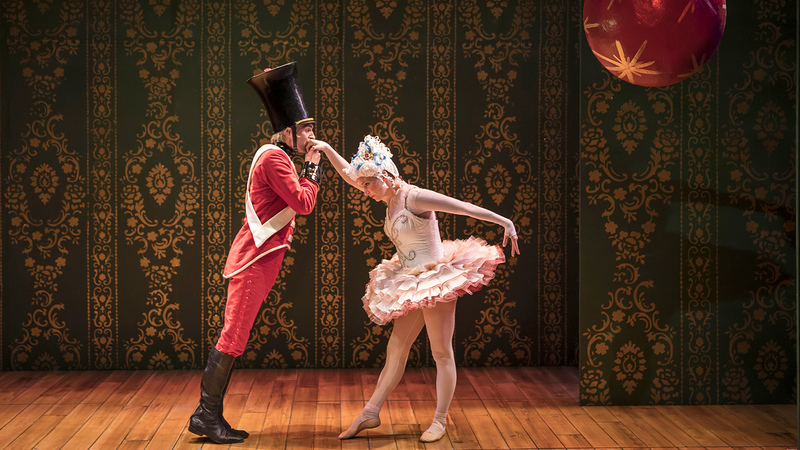 At the center of the story is the much-abused one-legged Tin Soldier of the title (the graceful and aptly hapless Alex Stein), a discarded Christmas toy who falls in love with a toy Ballerina (the rather awkward Kasey Foster). Each are seen in miniature toy form at times, but mostly they appear in their human incarnation. The poor Soldier is subjected to one misery and horrible fate after another, until there is nothing left of him but his steadfast heart. The toys begin “life” in the home of a family that includes a decidedly chilly mother, a gargantuan and obnoxiously willful baby, a caterpillar-like Goblin (the wonderfully fleet Anthony Irons), and a giant Rat (the happily gross John Gregorio, who also plays a Fagin-like fishmonger). But best of all is the fierce-spirited and irreverent Nursemaid (Christopher Donahue, a veteran of Zimmerman’s shows, whose marvelously expressive face says everything, and then some, in an altogether priceless performance). Adding immensely to the production are the bewigged musicians who are playfully engaged in their little orchestra pit beneath the stage. They include Leandro Lopez Varady (pianist, music director and arranger), Greg Hirte (violin), Michal Palzewicz (cello) and Constance Volk (woodwinds). And they are there to accompany the show’s musical epilogue as the actors join for a bit of heartfelt restorative advice in a song that pays homage to a steadfastness of spirit. “The Steadfast Tin Soldier” runs through Jan. 13, 2019 at Lookingglass Theatre at the Water Tower Water Works, 821 N. Michigan Ave. For tickets ($45-$85) call (312) 337-0665 or visit www.lookingglasstheatre.org. Running time is one hour with no intermission.